You are here: Home / FREEbies / Halloween FREEbies And Deals! 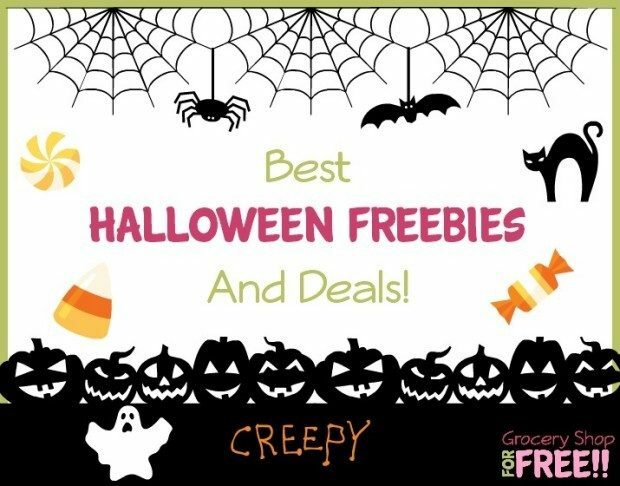 Thanks to The Coupon Project for this great list of Halloween FREEbies and Deals! Who doesn’t love a great deal and what makes a great deal even better? When it’s FREE! I LOVE FREE! Halloween is just around the corner! We’ve hunted down the best Halloween FREEbies and deals! Please leave a comment if you know of any others and we’ll add them to the list. 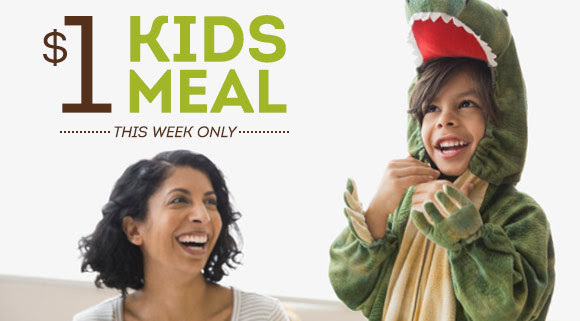 Kids in costume get a FREE kid’s meal on Halloween day at Pollo Tropical with the purchase of an adult entree. The promotion is all day on Saturday, 10/31 and available at all Texas Pollo Tropical locations. Enjoy any scoop for $1.31 at participating Baskin-Robbins shops nationwide on Halloween. Come into any Chipotle dressed in costume with an “additive” from 5pm-close to get a burrito, bowl, salad or tacos for just $3. Visit any participating Hot Dog on a Stick location from October 25-31 and say the phrase “Stick-or-Treat” to receive one stick item for $1. Choose from a turkey dog, Nathan’s beef dog, veggie dog, or Cheese on a Stick. 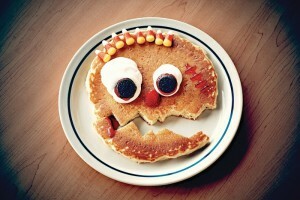 All kids 12 and under receive a FREE Scary Face Pancake on October 30 from 7am-10pm. 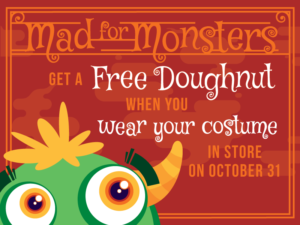 Come in costume to Krispy Kreme on Halloween for a FREE doughnut of your choice, including the new Monsters doughnuts. No purchase necessary; limit 1 doughnut per customer. Kids ages 12 and under who show up in costume will get a FREE kids meal with any full-priced adult combo purchase from 11am-midnight on Halloween. Limit two FREE kids meals per adult combo. Kids can participate in the coloring contest running now through October 31 to receive a FREE kids meal coupon. Kids in costume eat FREE at McAlister’s Deli on Halloween. Limit two FREE kids meals per adult entree. Print a coupon for $1 kids meal with purchase of an adult entree, valid October 26-30. Get a buy 1, get 1 FREE deal on large or extra large pizzas at Papa John’s when you order online and apply the coupon code TREAT15 (offer ends October 30). You can also buy $25 in Papa John’s gift cards and get aFREE 8-inch mega chocolate chip cookie through November 1. Kids 10 and under in costume eat a FREE brunch or lunch on Halloween (requires adult brunch or entree purchase; maximum two kids). All locations are also offering kids in costume (10 or under) a FREE entree and dessert from the Kids Menu on Halloween (maximum two children; requires adult entree purchase). Everyone in costume gets a FREE slice of pizza at Sbarro on Halloween with any $5 purchase. Kids 12 and under get a FREE Fun-Sized candy bar on Halloween! Stop by your local Bass Pro Shops from October 24-31 for a number of events, including a FREE photo with the Peanuts gang, FREE crafts, trick or treating, and a costume parade. Now through October 31, kids who come in costume to Chuck E. Cheese’s will get 50 FREE tickets per day. Come in to the LEGO Store between October 26-November 1 and ask a Brick Specialist for the clues you’ll need to find out what’s scaring Scooby-Doo. You’ll receive special Scooby-Doo stickers for helping in the mystery. Stop by Michaels on Halloween from 9am-3pm for a Monster Bash. Kids can wear their costumes and make trick-or-treat bags for $2 or get their faces painted for FREE. Kids can show off their costumes at Toys R Us on Halloween from 12-1pm with trick or treating and a picture opportunity with Geoffrey at the Halloween Parade event. Visit a participating pumpkin patch and you’ll get a FREE pumpkin stencil and stickers, plus be able to take your photo with “Peanuts” characters. Download a FREE vegan Halloween eBook from Abe’s Market. Recipes are included for breakfast, appetizers, main courses, desserts and sweets – yum! Download, print and cut out these FREE trick-or-treat cards for your neighborhood or your fall festival church outreach. Disney Movie Rewards members (it’s FREE to join) can download a FREE fun pack with tons of activities and decorations to help you host your own “Toy Story of Terror” party. 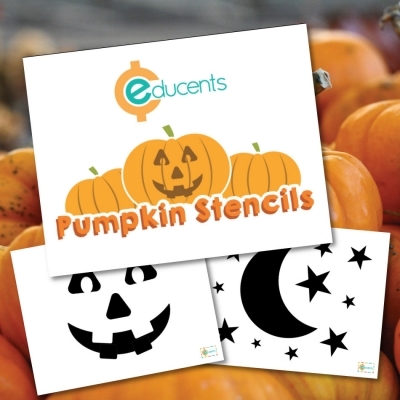 Download several different pumpkin carving stencils for FREE from Educents.